Fun Fact: Only prop to utilize only one material for construction and has also been used as dorm room decor! Mixed Media was one of my favorite classes in high school. In that class, we created various art pieces using any material set we wanted wether it be clay, paint, paper mache, or (in my case) steel. This prop was created for my class, but also served as a lesson in working with metal, both shaping and finishing/painting. 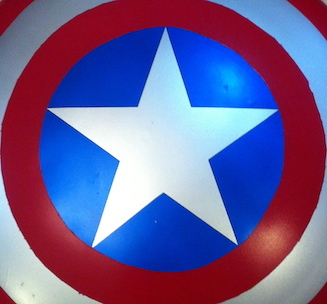 This prop was created using a steel sled that was cut and trimmed to size (roughly 26 inches in diameter). The ring patterns were lightly scribed into the shield's surface which allowed for an easier time masking areas for paint. Before painting, the original finish of the sled was sanded off and the whole sled was painted with rust resistant paint. 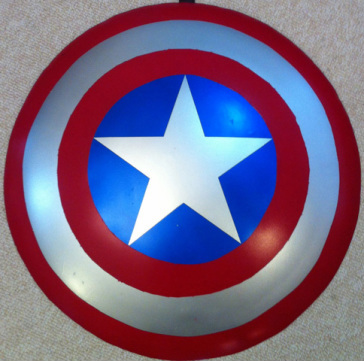 Since this prop was originally designed to be a display piece (for steel is dangerous and heavy to wield), a few adjustments to the back of the shield were implemented. Instead of mounting arm straps on the backside of the shield, a single leather strap with a D-ring was added to allow the shield to be hung on a wall!